SERENE & SPA-LIKE: Storage caddy with clear, textured raindrop panels and chrome plated accents. HANG QUICKLY: Caddy attaches over shower head with non-slip grip and suction cups for stability. EXTRA WIDE STORAGE: Baskets hold shampoo and conditioner bottles, soap, sponges and more. 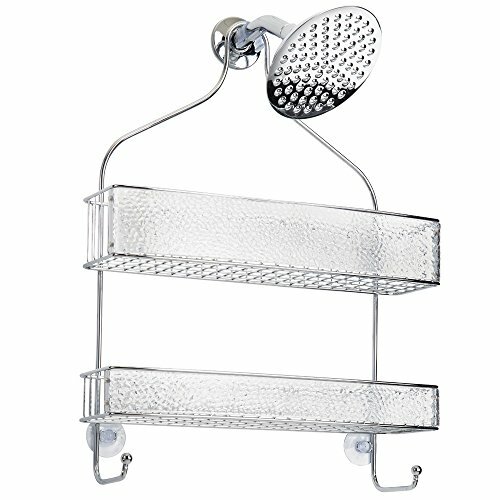 NO RUST: Steel shower shelves with Thermobond rust resistant coating. Measures 16.25" x 4.5" x 22". THE INTERDESIGN PROMISE: We put our expertise to work for you turning even the simplest must-have into an elegant accessory.